It seems with the close of every film festival or Hollywood collectible convention, another one opens. Such will happen November 13 to 15, 2015, at the Sheraton Airport Hotel in Cleveland, Ohio. When the momentary threat of a film festival in Columbus, Ohio, closing doors, Morris Everett of The Last Moving Picture Company decided to start his own. 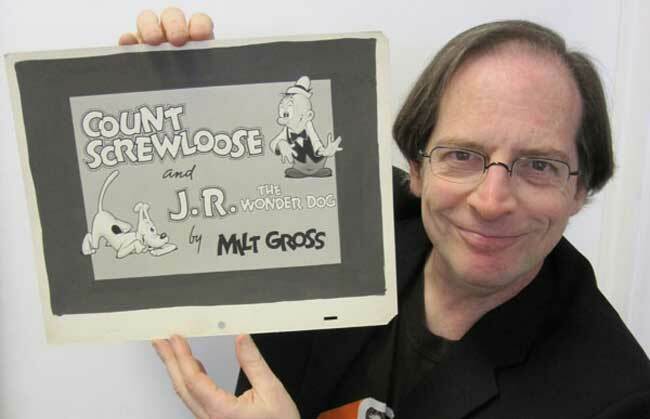 The Last Moving Picture Company (LMPC) was founded by Morris Everett, Jr. His store, located in Kirkland, Ohio, houses more than 40,000 vintage original movie posters and over 500,000 photographs. It is regarded the single largest stock between the East and West Coasts. He is also the co-owner of The Everett Collection, a successful New York-based firm and television photo leasing business. If you live within driving distance of Cleveland, Ohio, then you might want to check this out. More than 100 dealer tables will offer posters, lobby cards, photographs, arcade cards, DVDs, 16mm reels, movie magazines, celebrity autographs and much more. Photos below were taken from the recent Mid-Atlantic Nostalgia Convention, but are a prime example of the type of movie posters you will find for sale at the new Hollywood Poster Auction & Convention. The Captain Midnight radio program was among the more popular of children’s shows, centering around the character of flying ace Captain Midnight (formerly Captain Albright) who had received his nickname years before when he, as an Army flyer, returned from a dangerous mission at the stroke of twelve, just in time to save the Allied cause. The program first aired in 1938, and during the early years (under the sponsorship of the Skelly Oil Company) Captain Midnight and his friends belonged to an organization known as the Captain Midnight Flight Patrol. Late in 1940, a new sponsor (Ovaltine) took over and at this point the Flight Patrol was superseded by an organization known as the Secret Squadron. As the story unfolded, Captain Midnight was asked by the U.S. Government to head up this special new organization whose mission it was to assist federal authorities in fighting injustice throughout the world. Chief villain of the entire radio series was Ivan Shark, mastermind of a world-wide crime syndicate. Though Ivan Shark was the central antagonist, his equally unprincipled assistant Fang and his evil daughter, Fury, were often heard from. There were also other international bad apples, one of whom was Barracuda, a sinister figure of Oriental ancestry. During the war years, the villains regularly took on an Axis makeup, and that period saw Captain Midnight and his friends continually rushing from adventure to adventure in a never-ending effort to make the world secure once more. These 39 episodes, under sponsorship of The Ovaltine Products Division, ran nationally for four years through syndication. Screen Gems then ran them nationally under their own title as Jet Jackson, Flying Commando, for many years. 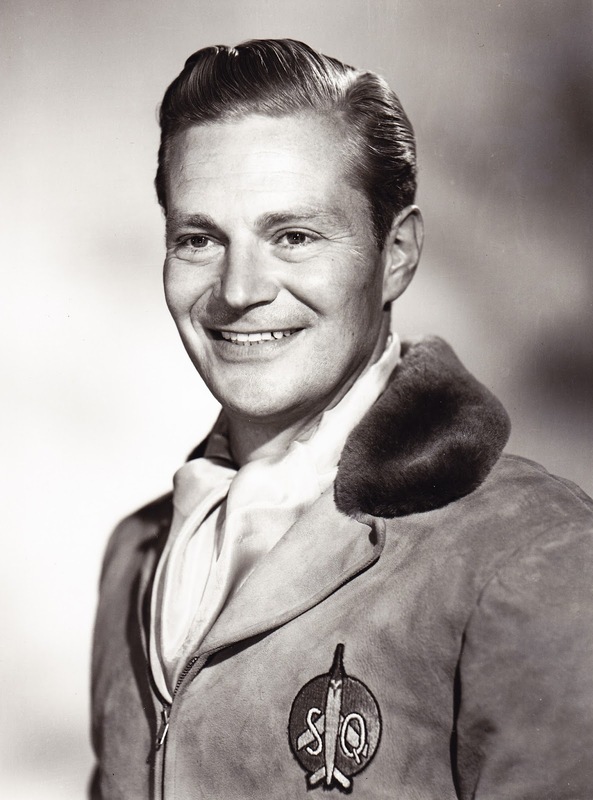 Ovaltine owned the name “Captain Midnight” so Screen Gems dubbed the words “Jet Jackson” in the soundtrack to avoid trademark issues. In 1968, Jet Jackson was the number one television series in Australia. In 1956, a National Poll indicated the public rating of then current heroes: Mickey Mantle, President Eisenhower… and Captain Midnight. You will no doubt find a number of Captain Midnight collectibles on the vendor tables this weekend: the 1940 American Flag Loyalty Badge, the 1941 Detect-O-Scope, the 1942 Mystic Eye Detector Ring, the 1945 Magni-Magic Code-O-Graph, and more. Over fifty collectibles were manufactured and distributed over fifteen years, not counting printed promotional material. 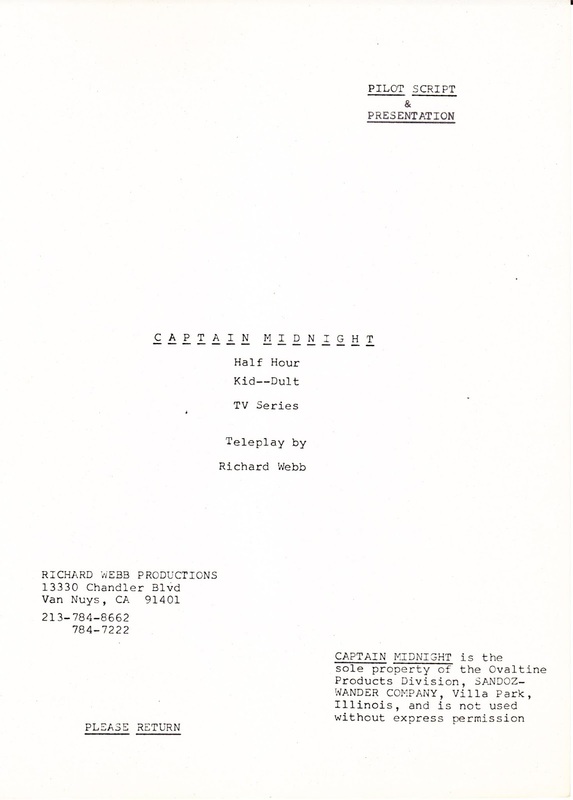 Script cover for unaired TV pilot. Sixty years following the conclusion of the television series, a rare discovery was made. It appears that in October 1974, Richard Webb acquired from the Ovaltine Company of Illinois the rights to Captain Midnight, to produce a new television series. Authored by Richard Webb himself, an updated space age version was scripted with all the familiar characters and locale, including the Secret Squadron Headquarters and laboratories in a remote section of the Mojave Desert. The lead role of Captain Midnight was in his mid-twenties, assisted by mechanic Budd (nicknamed Ikky), Ramsay (age 14) and Joyce Ryan (age 13). Without explanation or excuse, the pilot script established that Captain Midnight spent time on another planet, returned to Earth in a Flying Saucer (referred to as The Silver Dart), and uses the same craft as his personal mode of transportation on his missions planet-wide. In the pilot script, Captain Midnight and his crew investigate a highly effective method of sabotage at a geothermal site, discovering who the criminal is and his motives. Hoping to thwart the discovery of valuable diamonds under the ground, the villain used a long-handled sledge hammer to sabotage the drilling, with hopes the company would pack up and go home… leaving the diamonds behind for excavation. Until recently this script was not even known to exist. 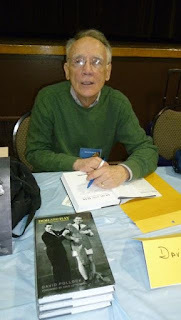 Webb, also a successfully-published author of Great Ghosts of the West (1971) and These Came Back (1974), wrote a novel titled Captain Midnight, contracted for publication with Hawthorn Books. The novel was never published. Such discoveries, decades after classic programs such as Captain Midnight went off the air, are continuing to surface courtesy of historians and dedicated researchers. (I personally would love to read Webb's unpublished Captain Midnight manuscript if that novel ever surfaced...) Some of these discoveries stem from flea markets, online auctions and vendors at film festivals. Which makes us wonder just what valuables are fated for discovery next weekend in the vendor room at the Mid-Atlantic Nostalgia Convention? 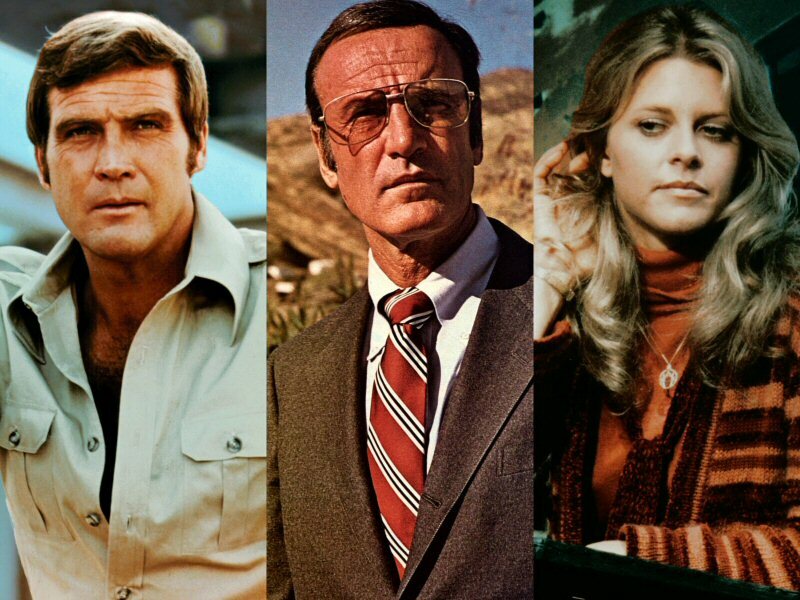 Anyone who grew up watching The Six Million Dollar Man and The Bionic Woman on television may be surprised to hear that a cast reunion (Lee Majors, Lindsay Wagner and Richard Anderson) will be held Sept. 17 to 19 at the Hunt Valley Wyndham Hotel. The tenth annual Mid-Atlantic Nostalgia Convention promises to surpass its nine previous installments, with three days of eclectic programming and celebrity appearances. This will be the third time since the television programs went off the air in 1978 that all three actors are coming together for their fans. Every year in mid-September, legends of Hollywood and Television fly in to Baltimore to attend the Convention solely to meet and greet with fans, sign autographs and pose for photos. If you questioned how people manage to post photos of themselves with Hollywood celebrities on Facebook, or on their blogs, the Nostalgia Convention is where it happens. Do not let the name of the event fool you: attendees represent states as far as California and Florida, and countries including Canada, England, Finland, Belgium and Portugal. Caroline Munro in The Golden Voyage of Sinbad. Among this year’s highlights are Jon Provost (Timmy on Lassie), Angela Cartwright (one of the Vonn Trapp daughters in The Sound of Music, Lost in Space), Caroline Munro and Martine Beswick (James Bond girls), Jeremy Ambler (The Walking Dead), Tempest Storm (1950s legendary burlesque performer), Veronica Carlson and Suzanna Leigh (Hammer horror stars), and a cast reunion for My Three Sons (Barry Livingston, Stanley Livingston and Tina Cole), among others. Celebrities at past events include Davy Jones, Shirley Jones, Patty Duke, James Darren, Ed Asner, Julie Newmar, Connie Stevens and even a James Bond, along with scores of others. It is convention policy to have different celebrities every year so fans who procrastinate for whatever reasons they find not to attend... it is their loss. But celebrities are not the only bullet point noteworthy to mention. What makes my mouth water are the slide show seminars that are conducted every hour, on the hour, throughout the weekend. These seminars are very informative and are conducted by authors, historians, researchers, museum curators, club presidents, magazine editors and even film preservationists. Among this year’s highlights is a history of Betty Boop (who turns 85 this year), the comedy of Abbott and Costello, a history of Popeye the Sailor, and question and answer sessions with celebrities on stage. Jerry Beck, a respected animation historian from the West Coast, is going to offer the two animation presentations. Personally, I have been waiting years for someone to do a presentation about Popeye, the Sailor. 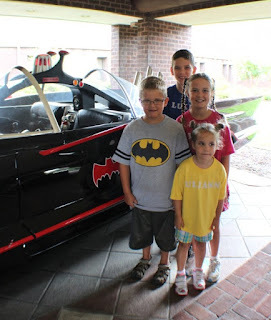 A charity auction will be held to benefit the St. Jude Children’s Research Hospital. Attendees can donate items for the auction and/or bid on items and every year the record is broken... raising money for children with treatable cancer. Hollywood celebrities and celebrated authors donated autographed books and glossy photos throughout the year. Like most events, vendors from all over the country offer collectibles ranging from comic books, tee shirts, movie posters and vintage toys. 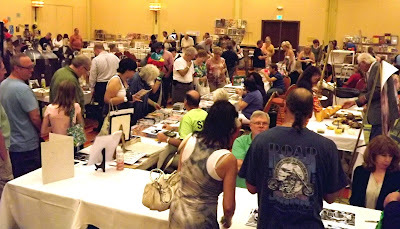 Many of the vendors occupying more than 200 vendor tables at the show are experienced in their field. Similar to the appraisers of Antiques Road Show, collectors can be educated in the grading of condition, how to spot a fake, and what is considered in today’s market a sound investment. Even if you are not the type of person to spend lot of cash during a convention, the education level is worth the price of admission. For film buffs, the Mid-Atlantic Nostalgia Convention also provides an alternative for those who cannot afford to fly to California to attend the Turner Classic Movies Film Festival, or San Diego Comic Con. The Nostalgia Convention is the equivalent of an East Coast TCM Film Festival. Terry Moore, for example, will not only be a guest at the convention but some of her movies will be screened as well. The screening room runs 24 hours a day and some of the films are so rare that you cannot find them on DVD commercially. This year's offerings include Incident at a Corner (a 1960 television special directed by Alfred Hitchcock), Shemp Howard comedies that have never been seen in seventy years, and Island of the Lost, a 1920 German silent version of the 1932 horror classic, Island of Lost Souls with Bela Lugosi and Charles Laughton. Vintage cartoons provide daily entertainment for children. 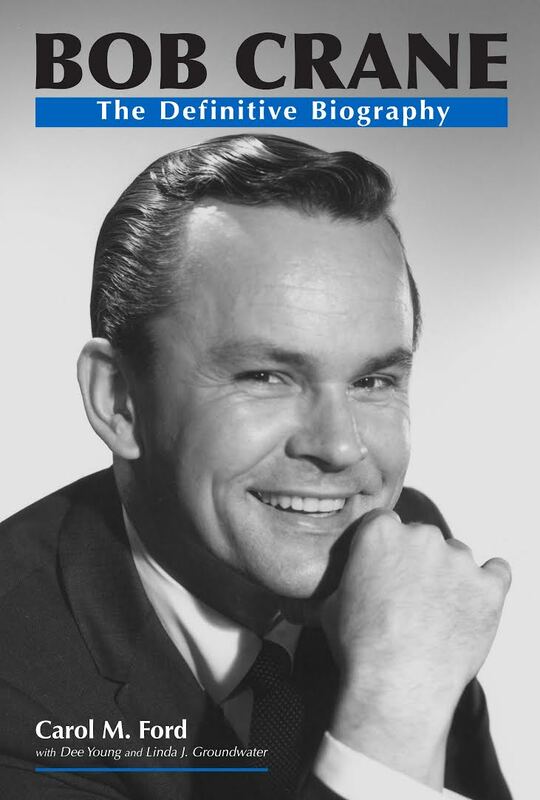 Author Carol Ford will be discussing the life and career of Bob Crane, star of Hogan's Heroes. Author David Pollock will be discussing the career of Bob and Ray. So much to see and do and the convention program guide is available for free download in PDF form if you contact the convention via e-mail through their website. 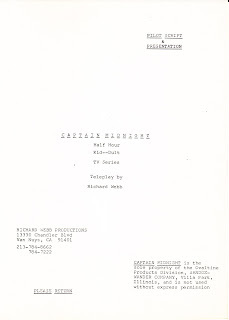 There are some fascinating articles worth reading in the 56 page program guide, including one contribution which will appear on my blog in a few days regarding the unaired TV pilot for Captain Midnight. Whether your plans are to meet a Hollywood celebrity and get their autograph, or get the appraisal for a vintage toy in your collection, the Mid-Atlantic Nostalgia Convention has plenty for the entire family. Held at the Hunt Valley Wyndham Hotel in Hunt Valley, Maryland, Thursday to Saturday, September 17 to 19. For more information visit www.MidAtlanticNostalgiaConvention.com or call 443-286-6821. The event is sponsored by AudioFlix.com, offering old-time radio programs and new radio dramas for a superb subscription price. Check out www.audioflix.com and discover that "no listening limit" really means!